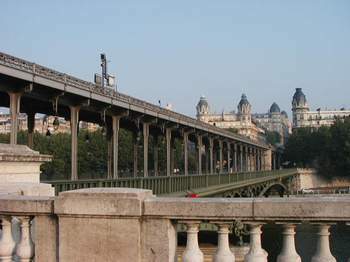 The pedestrian level of the Bir Hakeim bridge. The upper level is for the number 6 Métro train, one of the few elevated lines. Someone painted this graffiti recently at the Bir Hakeim memorial. It says "passoner," a word that is not in the French dictionary. I think they meant to say "passioner," which means something like "to live life to the fullest." The haze in the background is air pollution, not clouds or fog. 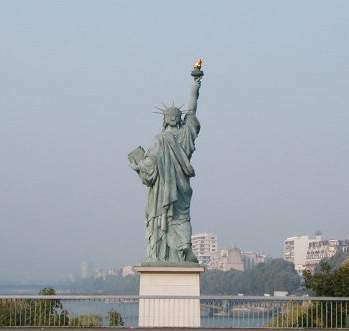 Lady Liberty in very polluted air. 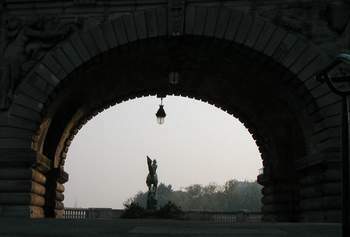 Looking through one of the Bir Hakeim bridge arches at the memorial. Very dirty air. 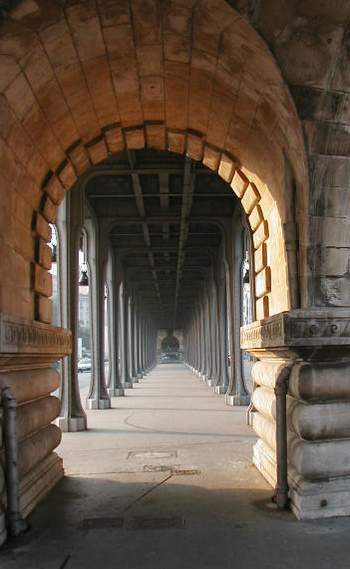 Here's another view of the bi-level Bir Hakeim bridge. Note the nice hanging lamps. If you look straight up, the sky looks a bit more like blue. But on the horizon, it is sort of a light shade of tan/blue/gray. Airparif says this has been the worst summer ever for air pollution in France. You're right; the heat wave is deadly serious. Much more serious than the "50" deaths officially reported by the health ministry. The doctors in France are furious with the government because they closed so many beds for the summer, and could have been much better prepared for this catastrophe. It is far more catastrophic than 50 deaths. All of the mortuaries are full. Completely full. All of them. One doctor in one hospital alone reported that in the past three days, there have been 25 heat-related deaths in his institution alone. This doctor was outraged at the "official" number of 50 deaths released by the government. Inflatable, temporary outdoor mortuaries are being set up -- we saw that on last night's TV news. The hospitals have people on stretchers on the floor because they have no place else to put them. Military hospitals are now accepting civilians, but that only makes a few more beds available. If an older person dies at home in the care of his family, the family must keep the body for about 9 days, until there is space in a funeral home. Undertakers are sent out to the home to take preliminary embalming steps, ensuring that the body won't degrade during the wait. The real number of deaths that can be attributed to the heat wave will eventually be determined, and the experts are saying it will be in the hundreds. We are essentially trapped because of the commitment to care for the apartment in August. This month the guardienne is on vacation in Portugal (where temps have gone as high as 109 degrees F.) So, we have nobody we can ask to come in and water the plants. We cannot give the key to just anyone. We don't want to disappoint the owners of the apartment because we want to come back here year after year. We have no air conditioning, as you know. Temperatures in the apartment reach 95 during the day, and they have typically been 100 to 102 outside. Many nights the temperatures do not drop below 86 in Paris, because of all the cars, pavement, and stone buildings holding the heat. The air pollution remains at the "trés mauvaise" level every day. That's very bad. It gives me sinus problems and it irritates Tom's eyes. His left eye swelled almost shut a few days ago. France gets virtually all of its electricity from nuclear power. I am certainly not opposed to nuclear power. But I must say it is a mistake to rely on it alone because in these hot times, the reactors are not so efficient since the water used to cool them is warmer than usual. The water they discharge into the rivers is very hot. The rivers are already too warm because of the heat wave. The operators of the reactors know that they must limit the discharges and limit the amount they raise the river water temps or else fish will die. But they are knowingly violating those limits now because if they don't, there will be blackouts. Fish will die, and then they will stink. Just like red tide. Next week, when power consumption goes up (after the August 15 holiday), EDF (the electric company) says there will probably be blackouts anyway. The "industrial minister" of France asks us all to conserve electricity -- a civic duty, she says. It is impossible to buy an air conditioner or fan. It has been that way since June. All sold out. Fortunately we already have two fans in the apartment. The forest fires in the south of France have been terrible. In Portugal, they've been much worse. The trees in Paris are losing their leaves due to the drought. So there is less shade. Also, invasive exotic moths from Macedonia are attacking all the chestnut trees in the city. Seriously. Actually, it is the moth's larva that is on the attack. So the chestnut trees are stressed out and losing more leaves than other trees, except perhaps the sycamore/plane trees. And all older trees now bearing fruit or nuts have been losing their limbs. The drought weakens the heavy branches, and they come crashing down. As a result, big sections of many parks are now roped off. It is forbidden to partake of the shade under these trees. 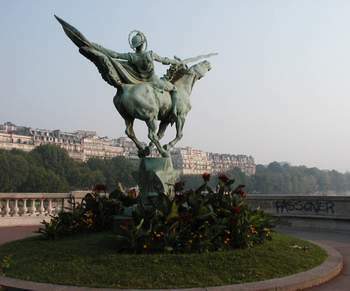 One of the affected parks is the Parc de Monceau, near where you stayed. The drought has been a disaster for French farmers. Thousands and thousands of chickens and pigs have died. A certain number of chickens die from heat every summer. But the number this year is astronomical. The strike of the intermittents (small time actors, musicians, technicians, and others who work in the "spectacles" and arts festivals) have effectively shut down the summer arts festivals that many towns rely on. Tourism is way down in France, partially due to this strike. The intermittents won't give up. Yesterday, they interrupted the premier of a movie here in Paris. Their demonstration in the theater resulted in a short brawl. They tried to interrupt the Tour de France, too. They don't want anyone to have any kind of fun until their grievances over the change in the unemployment system are resolved. Even with the change, their unemployment system is incredibly generous, compared to ours in the U.S. Liberal as I am, I just can't feel too sorry for them. And in this hot time, the intermittents don't seem to feel to sorry for anyone else. Health officials here have explained why older people are most susceptible to heat exhaustion. As we age, we don't sweat so well. Also, our sense of thirst diminishes, so we don't drink enough water. On hot nights, we don't sleep well and our internal organs don't get enough rest. Men over 65 are especially vulnerable to heat stroke. Tom isn't yet 65, but he had a very bad day on Monday and I was worried about him. I made him start wearing a damp t-shirt around the apartment, as I do. We do go out at night, and we've been going just to air conditioned restaurants. There aren't many, especially in August when many places are closed for vacation. We recently discovered a big, fancy Corsican resto on boulevard de Grenelle. Last night we had dinner there. It was fabulous. It's called La Villa Corse (164 blvd. 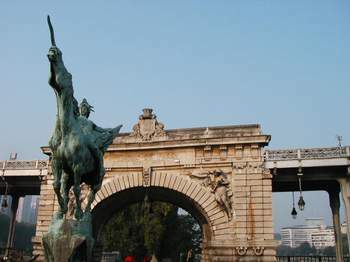 de Grenelle, telephone 53-86-70-81). Pretty expensive, but excellent. They have comfortable leather armchairs at every table! Dark paneling on the walls, good lighting (not too bright), beautiful mahogany bookshelves with lovely books, and good service add to the experience. And the food, oh the food. We had Corsican charcuterie for a starter, then I had a "stufatu" of veal. This is a tender veal roast in a red wine and tomato sauce with olives and tiny potatoes. Tom had lamb that was also very tender and tasty. It came with polenta, which Tom generously shared -- the best polenta I've ever had. No room for dessert. Can you ask David Citino what it means? My older brother is here on his honeymoon. He wanted a two star hotel, and so I recommended one way before we knew about the heat wave. They stayed there one night only, and then moved up to aother place that we found, a three star hotel with air conditioning and a special rate that was no more than the two star place. I'm so happy they have air conditioning. It would have been a lousy honeymoon without it.